We also love the point of view from Kenneth Morefield as printed in Christianity Today. Though the film doesn’t earn a Family Approved Seal, there’s lots to talk about with families. 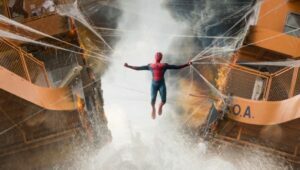 Spider-Man: Homecoming skews younger than most of the MCU movies set on Earth, and while Peter Parker’s adolescent wisecracks felt a little out of place in Captain America: Civil War, they help make Homecoming more entertaining than its predecessors. Personal tragedy frames Spider-Man’s origin, but since this film picks up where Captain America: Civil War left off, it does not feel the need to tread that ground yet again. Not retelling the origin story also gives the film room to explore and develop its characters. There are some great exchanges between Peter and Tony Stark that do more than simply repeat the familiar character beats from the comics. Peter’s hero worship is totally understandable given that he’s lost two fathers already, and it is suggested that Tony is beginning to wonder if he missed out on having a son of his own. Peter has to mature as a hero by learning how to master his powers and understand his limitations, but what is more refreshing is that he has to grow as a young man by learning to take responsibility for his own decisions. Ultimately, though, summer movies should be fun. This one is.